Enter to Win a Free No Excuses Online Workshop Package! No Excuses 2013 Journaling Inserts! Leave a CoMMENT and sign up for my Gina Rossi Armfield Newsletter along with your EMAIL ADDRESS in the COMMENT to ENTER TO WIN! Want to take a workshop with me in person? on the beautiful Columbia River! Winner will be announced June 1! *NOTE - this mailing list is for No Excuses Journaling ONLY so if you are signed up for my personal newsletter you must sign up again here for the drawing ;)! Please grab this BADGE to use on your own site! The Companion DVDs are available NOW in the North Light Book Store and Amazon! And if you like what you see PLEASE Leave me a good review on AMAZON! WINNER IS ..... DRUM ROLL PLEASE! You will Win all 3! Please include your email so I can contact you! Don't Forget to take a peek at these! 50% off Coupon for any of my online workshops! Check out these great artist's sites for a chance to win 1 of my DVDs! Win a FREE WORKSHOP of your Choice! To ENTER TO WIN leave a comment letting me know what workshop you would love to win and why! Visit my Workshop Site to See All that are available! I am so happy that you decided to stop on by! For the next two weeks we are going to be giving away goods and hopping blogs! Enter to Win a FREE 8x10 Acorn print matted and signed! Do all three and your name goes in 3 times!! There will be new drawings everyday so make sure and stop by! I am happy to announce my new site! 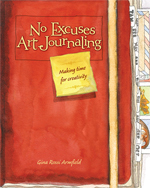 NO EXCUSES ART JOURNALING ~ MAKING TIME FOR CREATIVITY! As a special WELCOME to my new site dedicated to all things NO MORE EXCUSES! I am having a PARTY! Each day for the next few weeks a different Artist will be giving away one of my companion DVDs! on their blog! and I will be giving away free workshops and coupons! Check back for Giveaway and Blog Hop Details beginning May 20th! or better yet sign up for my newletter and I will keep you posted so you don't miss a thing!